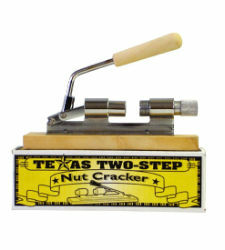 A simple and effective nutcracker with an angled handle which cracks pecans, easier and faster. Made from welded steel. Chrome plated with large wooden base. Bent handle improves leverage for smoother use. Knarled sizing handle makes for easy use.